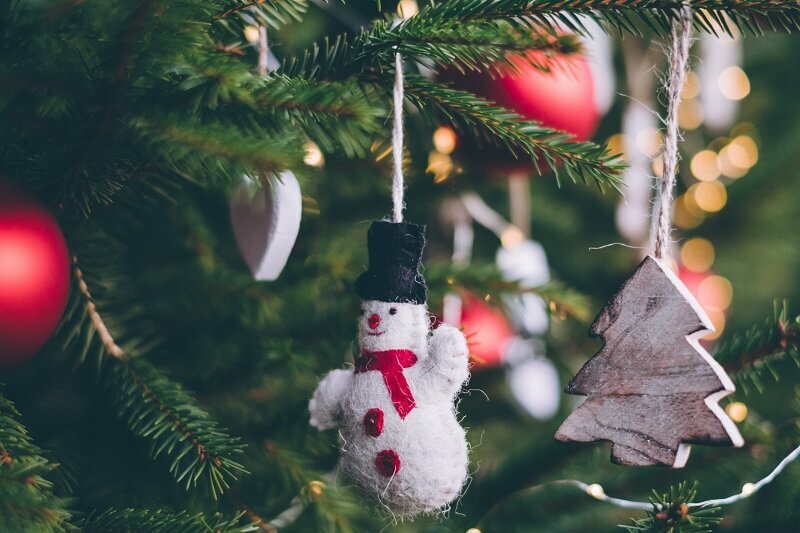 5 Christmas Tree Safety Tips–for Those of Us with Real Trees! Lately the controversy has been heating up about which is the greener choice: a real Christmas tree or a fake one. If you really think about it, the real tree seems to be the greener choice, but surprisingly, over 80% of trees Americans will display in their homes this holiday season will be fake. That still leaves about 20% of us committed to the real tree, and that means it’s worth reviewing Christmas tree safety tips. So our gift to you today: 5 Christmas tree safety tips. Buying your tree earlier in the season might help you to find a fresher one too. The longer the tree sits on the lot waiting to be sold, the more dried out it will get. We don’t put our tree up until right before Christmas but we buy it early, cut off the bottom 2 inches of the trunk, and keep it outside in a bucket of water until we are ready to put it up. We heat our house with a woodstove (because it was built in 1890 before central heating), and that can quickly dry out a tree, we learned the hard way. Keeping the tree in a bucket of water like just described has made a big difference in keeping the tree fresh. As much as you might want something grandiose for displaying in your home, you don’t want your tree to be a hazard! So give your space serious consideration before you head to the tree lot. Our living room has ceilings that are 9-feet high, but our living room is small so the tree has to be skinny. It takes us a while to find a tall but very skinny tree! Even then, we end up trimming branches before we decorate, to make sure the tree is not sticking out and in the way at all. Once your tree is in the house, you’ll put water in the tree stand, of course, but you have to keep up with it. Your house is warm and that will dry out the tree quickly. Keeping the stand filled with water will help to slow down that process. And don’t let the tree stand go dry. If the bottom of your tree gets a chance to harden up again, you’ll have a hard time getting it to soak up any water. I make watering the tree part of my nightly routine, even when it’s soaking up less water after a few days. I don’t like turning off the lights on our Christmas tree. We only have it up for 3 weeks each year, so I want it lit up 24 hours a day during that time. That’s not safe, however. It’s not safe to have to climb under or around the tree to unplug the lights before bed either (something we are guilty of), so consider using a timer for your tree lights, or a surge protector with a switch, or something else that ensures you’ll turn the lights off when gone or in bed—without jeopardizing the tree. I have to admit I was saddened by reading that only 20% of us are using real Christmas trees. There’s just something about the search for the right tree, the smell of the tree, the uniqueness of each tree every year…it would be hard to give that up. So for now, I count myself proudly among that 20%, using a real tree and following the tips above to keep it safe!